The Bahama Parrot, a subspecies of the Cuban Amazon, on the island of Abaco is the only parrot that nests in underground holes formed by rainwater dissolving limestone rock. A.l. leucocephala: Both adults green with black scalloping to feathers; forehead, forecrown, and area around eyes white; pink/red lores, cheeks and throat; ear coverts dull black; abdominal patch maroon; tail green with red at base. Bill horn colouration. Eye ring white, eye olive/green. A.l. palmarum: Both adults darker green, abdominal patch more extensive; deeper red to throat. A.l. caymanensis: Both adults more yellow/green, with less evident scalloping to feathers; breast and rump tinged with blue; white on head confined to forehead area; green on sides of neck separates red of throat from the cheek area; less extensive abdominal patch; larger in size. A.l. hesterna: Both adults more yellow/green; more evident maroon abdominal patch; cheeks and throat deeper in colour; smaller in size. A.l. bahamensis: Both adults as in leucocephala, but abdominal patch small or missing; white on crown extends back further, reaching below eyes to lores and upper cheeks; less red at base of tail; larger in size. As in adult but with less black edges to body feathers, white of forecrown washed with yellow and less maroon on belly. Wide variety of loud shrieks, whistles, screeches, some trumpet like. Some notes drawn out and resonant. 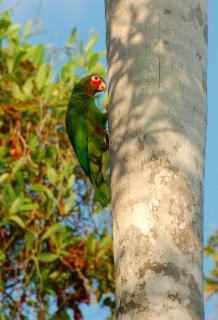 Parrots: Status Survey and Conservation Plan 2000-2004, Snyder, McGowan, Gilardi and Grajal, 2000. Psittacine Aviculture, Schubot, Clubb and Clubb, 1992. Rare until 1970s then increased breeding in captivity. Probably up to 50-60 yrs. Aviary or suspended cage with a minimum length 3m (9.8 ft). Fruit - any type especially apple, pear, orange, banana, cactus fruits, pomegranate, forming about 30 % of the diet; fresh vegetables such as carrot, celery, green peas, beans, fresh corn, green leaves; spray millet and limited mixed seed, cooked beans and pulses, complete kibble. Bathing; foot toys, destructible (non-toxic) toys, non-destructible (non-toxic plastic) toys, food-finder toys, preening toys, different texture and size hanging perch toys, fir branches, push-and-pull toys (sliding up and down), vegetable tanned leather toys. 12" x 12" x 24" ( 30.5cm x 30.5cm x 61cm) vertical box. Habitat loss severe; trapping for wild bird trade, hurricane damage to nesting trees, loss of nesting trees due to damage inflicted while collecting chicks. A.l. leucocephala: E and C Cuba. A.l. palmarum: Isla de la Juventud and W Cuba, east to Villa Clara province. A.l. caymanensis: Grand Cayman Island. A.l. hesterna: Cayman Brac and formerly Little Cayman Islands. A.l. bahamensis: Great Inagua and Abaco, in Bahama Islands; formerly on other islands in Bahamas. Occurs in pine forest, broadleaved woodland, palm groves, mangroves, plantations, cultivated land with trees and gardens. Up to 1000m (3280 ft). Includes leaf buds, cones, tender shoots, fruit and seeds. Sometimes cultivated crops. Generally found in small groups while foraging; bigger groups where food is abundant. In pairs for breeding. Roosts communally.